Why Do Indoor Plant Leaves Turn Brown? When caring for houseplants, the first thing to remember is that your living room, kitchen or bedroom is an unnatural environment for any plant. They can be kept healthy inside, of course, but plants are best suited to a wide range of conditions, all of them outdoors. 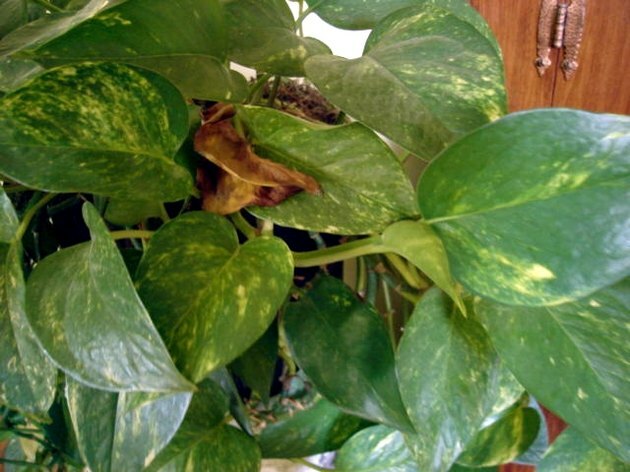 Brown leaves could be one sign that something is missing from your plant's indoor home. So, the first step in caring for a houseplant is to find out what its native environment is and then do your best to re-create those conditions indoors. When a plant's whole leaf turns brown, it might be a natural occurrence, such as the Syngonium in the photo. This is actually the plant's flower, not a leaf, although it may look like one. It has simply followed its natural cycle of bloom. However, brown leaves could also signal of sun burn if the plant is in direct sunlight or the onset of disease or an insect pest. Examine the leaf carefully, both on the top and underside, to see if you can identify anything amiss. Humidity levels also can also affect leaf vitality. Most indoor environments have much lower humidity than plants experience outdoors. If there is not enough moisture in the air, the entire leaf or just the tips can turn brown. Try using a mister around your plants once a week. Plants need differing amounts of water. 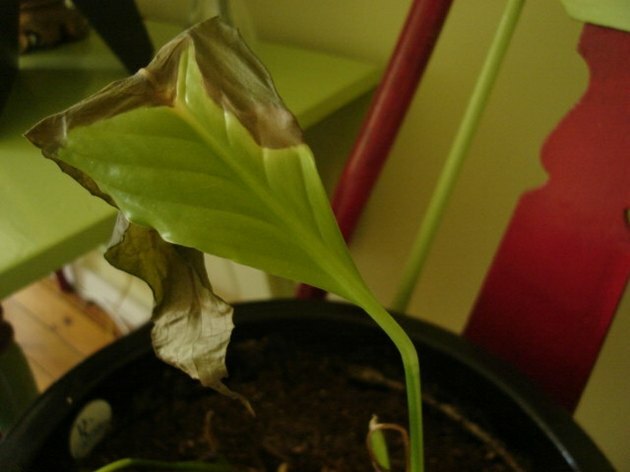 When the leaf tips of an otherwise healthy plant turn an ugly brown, this can be caused by too much water or not enough. If the plant is being watered too frequently, excess water can pool on the ends of the leaves, causing them to rot and turn brown. If the plant is not getting enough water, the leaves will wilt, curl and begin to brown from the tips and up through the entire leaf. One way to check water levels is to examine the rest of the plant. Do the stems or stalk look healthy? You also can stick your finger into the soil, which should not be muddy or bone dry. Most plants do best with consistent moisture. Adjust as needed. 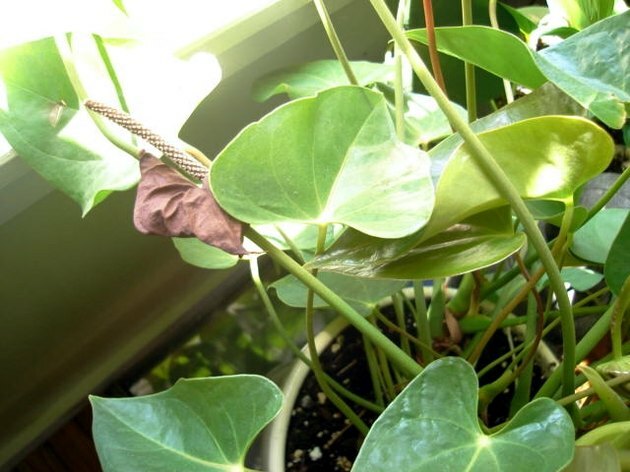 Most houseplants cannot live on only the soil in their pots and require a regular application of fertilizer. This, too, can help keep the leaves green and healthy. Mardi Link is a former police reporter, covering crime and law for five years. She has two true crime books, When Evil Came to Good Hart and Isadore's Secret (University of Michigan Press). Her articles appear in The Detroit Free Press, ForeWord, and TC Business News. She lives in northern Michigan. What Are the Causes of Bushes Turning Brown? 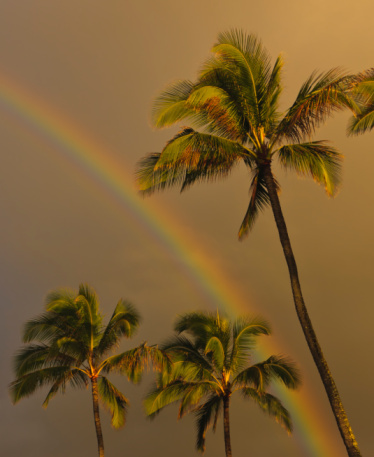 What Causes Brown Spots on Palm Fronds?